We all have memories of growing up with the four food groups, but since the development of the U.S. Department of Agriculture's Food Guide Pyramid in 1992, we're getting used to this improved concept of eating. The whole idea of the pyramid is that its shape guides you to the healthful number of daily servings of foods in each category: more from those foods at the base, fewer as you move up. Today there is a Mediterranean Pyramid, an Asian Pyramid and even pyramids for kids and seniors. But when you're pregnant and have unique nutritional needs, there's not a pyramid in sight. Not one, anyway, that addresses your increased need for folic acid, iron and calcium. Or warns you about foods that may be harmful to your baby. Or reminds you to exercise. Until now. Fit Pregnancy presents our Pregnancy Food Guide Pyramid, which will help you understand — at a glance — what you should be eating. Our pyramid is based on time-tested knowledge, as well as the latest nutritional guidelines for a safe pregnancy and healthy baby. The health of your baby today — and even her risk for disease as she grows — is strongly influenced by the foods you eat during your pregnancy. Following our Pregnancy Pyramid guidelines will take the guesswork out of eating for the next nine months. (Ideally, you should be gearing up for pregnancy months before conception.) Folic acid, the B vitamin that helps prevent neural-tube defects, is perhaps the most important nutrient to consume in the first few weeks after conception. Since most women consume far too few folic acid-rich foods, it's a good idea to start taking your diet seriously as soon as you find out you are expecting. It takes more than 40 nutrients, including vitamins, minerals, fibers, proteins, carbohydrates, fats and fluids, working in concert to build a healthy baby. Here's a quick glance at what you need, why you need it and where to get it. Protein Protein helps build the baby's tissues, the placenta and your red blood cells. Best sources: extra-lean meat, chicken, fish, milk products, cooked dried beans and peas, and soy products. Carbohydrates Starches and other complex carbohydrates provide fuel for you and the growth of your baby. Some carbohydrate-rich foods, such as crackers and dry toast, can also help fend off morning sickness. Best sources: whole-grain breads, bagels, tortillas, cereals, pastas, crackers and starchy vegetables such as sweet potatoes. Daily requirement: at least 325 grams. Fats Fat adds calories without much nutritional clout and should be limited to no more than 30 percent of your total calories. Include an occasional serving of fish, which contains omega-3 fatty acids needed for the development of your baby's brain and eyes. Daily requirement: no more than 73 grams for a 2,200-calorie diet and 83 grams for a 2,500-calorie diet. Vitamin A This fat-soluble vitamin (meaning it should be taken with a small amount of fat to be best utilized) helps maintain the immune system and contributes to cell and tissue growth. Best sources: carrots, sweet potatoes, spinach, collards, apricots, mangoes, cantaloupe, peaches and fortified milk. Vitamin D This fat-soluble vitamin helps build strong bones for both you and your baby by aiding in absorption of calcium and its deposition into bones. Best dietary sources: fortified milk (not milk products), salmon, sardines, fortified cereals and egg yolks. 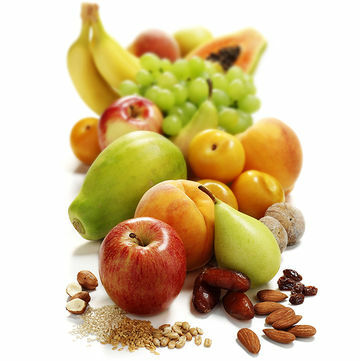 Vitamin E This vitamin helps protect tissues from free-radical damage, which undermines health. Best sources: wheat germ, safflower oil, nuts and spinach. Vitamin K This vitamin aids in blood clotting and bone formation. Best sources: dark green leafy vegetables such as spinach, broccoli, Romaine lettuce, kale, collards and Swiss chard. Vitamins B1 and B2 and niacin These three vitamins are essential for converting food into energy. They also aid in digestion and are essential for the normal growth of your baby's body and brain. Best sources: whole grains, wheat germ, peanuts, green peas, dark green leafy vegetables, lean pork, cooked dried beans and peas, extra-lean meats and nonfat milk products. Daily requirements: 1.5 milligrams B1, 1.6 milligrams B2, 17 milligrams niacin. Vitamin B6 This vitamin aids in the production of neurotransmitters (chemicals that relay messages between neurons) and proteins for new cells. Best sources: chicken, fish, extra-lean meat, avocado, potatoes, bananas, whole grains, wheat germ, nuts, seeds, and cooked dried beans and peas. Folic acid This B vitamin is essential for normal cell division and prevention of birth defects in the developing fetus. Best sources: dark green leafy vegetables, asparagus, broccoli, orange juice, wheat germ, cooked dried beans and peas, and fortified grains. Daily requirement: 600 micrograms (4 milligrams for women with a family history of neural-tube defects); most prenatal vitamins supply 400 micrograms, and the rest are easily supplied in your daily diet. Vitamin B12 This vitamin aids in the normal formation of proteins. Best sources: extra-lean meat, chicken, fish, eggs, milk, tempeh and miso. Vitamin C This water-soluble antioxidant protects the tissues from free-radical damage. Best sources: citrus fruit, Brussels sprouts, strawberries, green and red peppers, and dark green leafy vegetables. Calcium This mineral helps build and maintain bones. Studies show that it also may help prevent preeclampsia, or pregnancy-induced high blood pressure. Best sources: nonfat and low-fat milk products, sardines, tofu, dark green leafy vegetables, canned salmon with bones, and cooked dried beans and peas. Chromium Both you and your baby need chromium to regulate blood sugar. It also builds proteins in baby's developing tissues. Best sources: whole grains, wheat germ and orange juice. Copper This trace mineral is essential for energy metabolism and the formation of connective tissue and red blood cells. Best sources: chicken, fish, extra-lean meat, organ meats, whole grains, nuts and seeds, soybeans and dark green leafy vegetables. Iron Besides preventing anemia, iron helps your baby develop and gain weight and might help prevent premature delivery. Best sources: extra-lean meat, fish, poultry, cooked dried beans and peas, dried apricots, dark green leafy vegetables, raisins and whole grains. Magnesium You need this mineral for energy metabolism, blood sugar regulation, normal muscle contraction and nerve transmission, and uterine relaxation during pregnancy and contraction during labor. Best sources: nonfat or low-fat milk, peanuts, bananas, wheat germ, whole grains, cooked dried beans and peas, and dark green leafy vegetables. Selenium This antioxidant mineral is essential to growth and protects tissues from free-radical damage. Best sources: whole grains, seafood, lean meat, and nonfat or low-fat milk products. Zinc This trace mineral reduces the risk of spontaneous abortion and premature delivery, helps prevent birth defects and aids in normal growth. Best sources: extra-lean meat, turkey, cooked dried beans and peas, wheat germ and whole grains. Just as it is vital throughout your entire pregnancy, nutrition plays an important role in recovering from pregnancy. It's also never too soon to start nourishing the next baby. So, if you plan to add to your family, resume competition sports, or simply survive the stress of juggling family, work and home, you should begin restocking your nutrient stores immediately after your baby is born.